The outdoor-in glass aesthetic, floor plan, and simple, clean, angular lines of an Eichler help to gently define spaces that flow one into another. 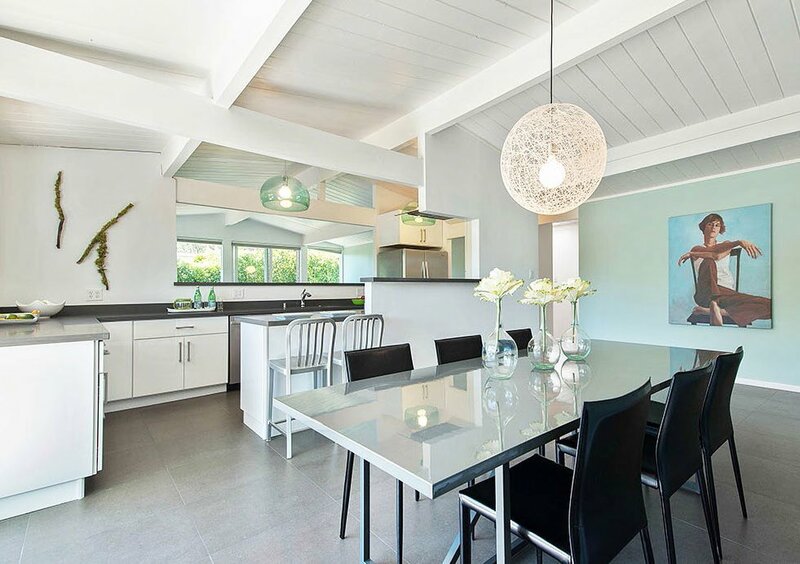 Above: In a design by Klopf Architecture with Da Lusso Design, this Palo Alto Eichler takes that aesthetic to an even higher level, flowing from outside, to inside, to outside again. Staging a home for resale differs from staging a home for everyday life. For-sale staging is all about de-personalizing, decluttering, and creating a minimal environment, like the before-and-after kitchen photos above staged by Marin realtor Renee Adelmann. If you think 'floating furniture,' 'layered lighting,' and 'proven dishes' sound like thematic content from your favorite home-improvement TV channel, you may be right. But, more importantly, when you link these terms specifically to the mid-century modern lifestyle, they refer to useful ways for enhancing the look, feel, and personality of our homes' interior spaces. Eichler's architectural features were fashioned to highlight each home's natural elements. The outdoor-in glass aesthetic invites light and fresh air—nature's disinfectants. Open floor plans and simple, clean, angular lines help to gently define spaces that flow one into another. Natural materials such as wood, cork, and stone harmonize to create interesting, yet surprisingly tranquil spaces. It's helpful to keep these natural elements in mind when designing and decorating your home's interior spaces—organically planned so long ago and so highly sought after today. Embrace them. Learn to love them. Design to enhance rather than interfere with them. 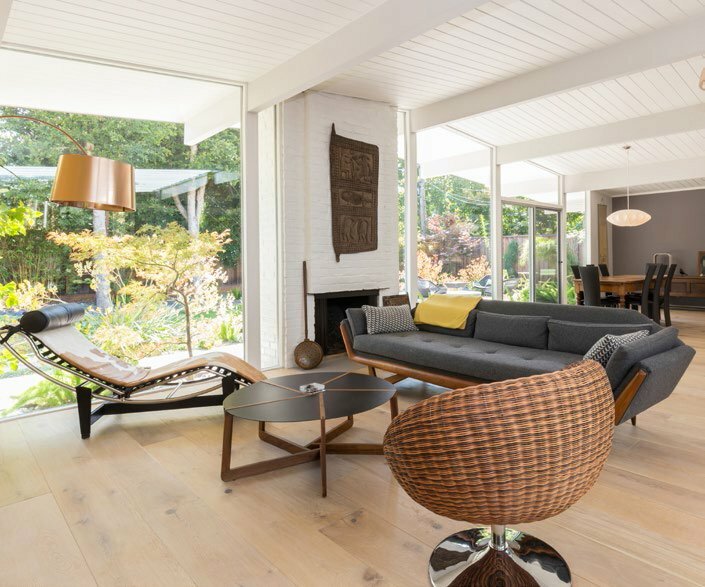 "Many of the Eichler buyers we work with in Silicon Valley are engineers who want simplicity in their private spaces," points out real estate broker Janelle Boyenga, of the Silicon Valley-based Boyenga Team. "They are drawn to Eichlers because of their simple, clean lines and relaxing, Zen-like qualities." To accent those qualities, real estate marketing employs home staging techniques—"enhancing the features of a home to elevate its value for resale," explains Severine Secret, interior designer and founder of Go2 Design Studio, based in Saratoga. Staging, she says, makes it easier for people to walk into your home and project themselves, thinking, "I could live here!" Drawing on the rich resources of stagers and interior designers, and applying certain universal themes—along with some personal ingenuity of your own—can help you enhance your own spaces, whether it's for everyday living or for hosting social events. Harmonious interior design, however, is not always intuitive. Studying photographs or attending well-staged open homes can be exciting: most of us instinctively know 'that special look' when we see it, but can't always say why one thing works and another doesn't. Staging a home for resale differs from staging a home for everyday living and special family events in several ways. "Staging for sale is all about de-personalizing, decluttering, and creating a minimalist showroom-styled environment," says East Bay stager Camila Baum. "When done well in Eichlers, it also draws attention to your home's architecture." On the other hand, she clarifies, "staging and designing for family purposes is the most personalized approach you can take. You want to show off your items rather than hide them." The knowledge and skills of professional stagers and interior designers can provide insight into improving the look, flow, and utility of your living spaces. 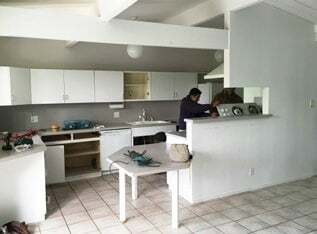 Aided by their input, let's apply some successful staging techniques for improving your home's interior, with an emphasis on understanding and incorporating Eichler-friendly design principles. So...the family has decided to hold its annual shebang at your home. No need to panic. Help is on the way.